You are marrying the person you love, throwing an epic celebration for your friends and family to attend. How can you plan a wedding ceremony everyone will remember? So many people have weddings, how can you make yours unique and unforgettable? Celebrate your special day in style. Wedding sparklers are a great touch to your special day. Have your guests waiting for your exit, sparklers in hand as you embark on the journey of a lifetime. 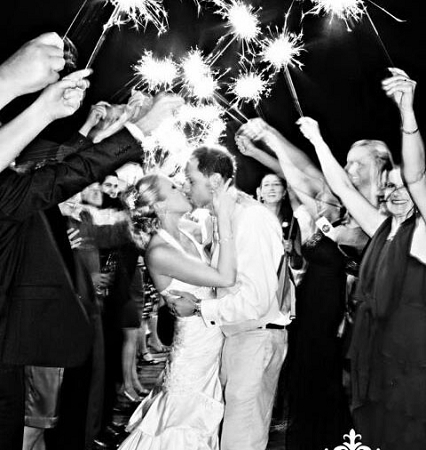 Wedding pictures with sparklers will have your guests posting pictures that will make everybody wish they were there! Make a special hashtag for your wedding celebration. Your hashtag can be “punny” if your names allow for it! Ensure your special day is unlike any other with your very own signature cocktail! Not only does this make your wedding unique, but it can also help save money on an open bar. Do some research and talk to bartenders about a concoction your guests will enjoy and talk about for years to come! Have you ever attended a wedding where the music was a bust? Bad music can really bring down the mood of the reception. Hire a DJ who will keep the party going AND take requests! Your guests know best! Let them put in song requests for the DJ to play their favorite songs. The best way to get the crowd dancing and moving? Play music they want to hear! Create stations for your guests to get involved! For example, provide DIY mashed potato bars or ice cream sundae stations. Allow your guests to choose toppings and options for their different meals, dessert and drink needs. Do it yourself stations allow your guests to get involved and pick toppings for their different options. At Wedding Sparklers Outlet, we have the best sparklers for celebrating your special day! Now start planning a wedding celebration everyone will remember!